The Software Campus project FRAGMENTS is about interacting with intelligent environments. 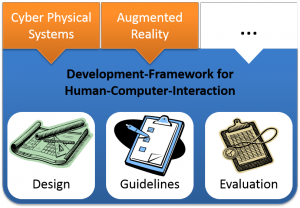 The goal is to create a software framework which can facilitate the design and development of efficient and intuitive user interfaces by the use of appropriate design guidelines. The editor at the core of the framework enables short iteration cycles by providing basic interface components, rule based evaluation and support for user testing. It can be extend via modules to support different interaction modalities and communication protocols. The modules planned in the scope of the project are the connection to an Internet of Things (IoT) back-end, which is the basis for most intelligent environments, and the support of Augmented Reality (AR) as a novel interface.